Pope Francis on Sunday called on young Lithuanians to have the courage "to swim against the current of individualism" and to reach out to those close to them. 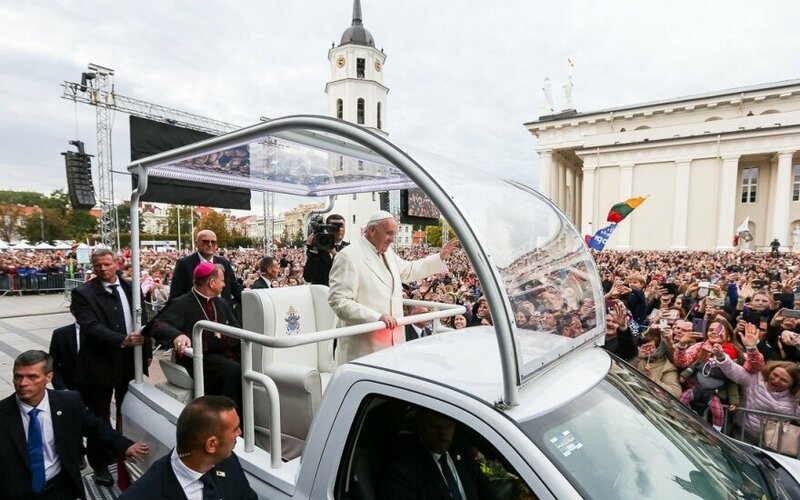 The head of the Roman Catholic Church also underlined the importance of belonging to a people as he addressed several tens of thousands of young people in Vilnius' Cathedral Square. "Let us swim against the current of that individualism which isolates us, makes us egocentric and vain, concerned only for our image and our own well-being," the pope said. "Life is ugly when you stand in front of the mirror. But life is beautiful when you are with others: in the family, with friends, when you fight together with your people," he said. The pontiff said that belonging to a people gives one the strength to fight, but, at the same time, it gives tenderness. "Who we really are has to do with our being part of a people. Identify is not the product of a laboratory; it is not concocted in a test tube. (...) We are not rootless," he said. Francis encouraged young people to meet and speak with elderly people and draw on their knowledge and experience. "It's not boring to talk to old people," the 81-year-old said half-jokingly. Francis mentioned Lithuania's two leading basketball teams when he spoke about competition. "It makes no difference whether Žalgiris Kaunas or Vilnius Rytas are in first place," the pope said. " I'm asking you, 'Which is in first place?'" "What matters is not the result, but the fact that the Lord is at our side," he answered as the crowd shouted. Some of the pope's remarks, such as the one that "following Jesus is a passionate adventure" met with cheers from the crowd. The meeting with young people wrapped up the first day of the pope's two-day visit to Lithuania. On Sunday, he will go to Kaunas to celebrate Holy Mass in the city's Santakos Park and will travel back to Vilnius later in the day to visit a monument to the victims of the Vilnius Ghetto and the Museum of Occupations and Freedom Fights.